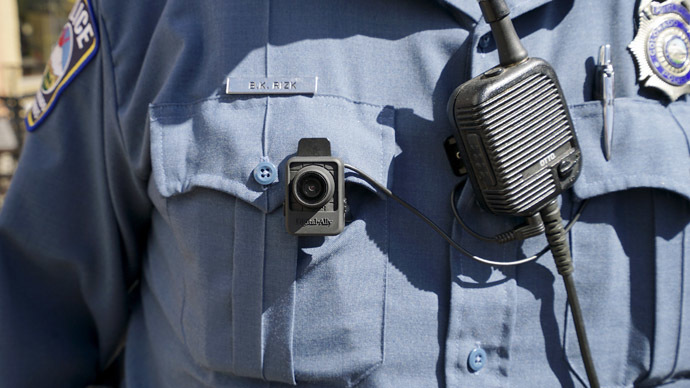 The Department of Justice has unveiled a program that will equip police officers with nearly $20 million worth of body cameras among as many as 50 law enforcement agencies across the United States. The Body-Worn Camera (BWC) Pilot Partnership Program announced on Friday puts aside $17 million in competitive grants to go towards body cams, as well as $2 million for training and assistance and $1 million to help evaluate the technology. The Justice Department expects to give out 50 awards through the new program to various law enforcement agencies, but the contracts will require the winning departments to match the contributions with their own funds. One-third of the grants given out under the BWC program will be allocated to smaller agencies, the DoJ said, and the $17 million will be part of a broader effort announced by US President Barack Obama in December to invest $75 million towards acquiring 50,000 cameras over three years – itself part of an even larger White House initiative to invest more than a quarter-billion on funding and training law enforcement announced last year. Costs for acquiring body cams and maintain infrastructure to preserve digital evidence range depending on vendor, contract and type of service, among other factors, but in many instances cities have invested millions of dollars into such program. An ongoing effort in San Diego, California is expected to set the city back around $3.9 million over five years, according to a recent Associated Press report, and a proposal weighed last year in Baltimore, Maryland was cut after the mayor learned it would have cost the city $2.6 million annually just for storage and hiring extra staff. “Knowing how we didn't have a lot of wiggle room with the budget constraints we face, we couldn't afford to get it wrong,” Baltimore Mayor Stephanie Rawlings-Blake said when she vetoed that plan in December because she believed costs had not been adequately considered. In the last month, however, her city has been transformed into the latest epicenter in America for an emerging debate on police accountability. Freddie Gray, a 25-year-old black man, died in mid-April from injuries sustained while in the custody of the Baltimore Police Dept., and on Friday the six officers involved were indicted on charges related to his death. Along with the public outrage that erupted in the street of Baltimore upon Gray’s arrest and subsequent death, video footage of his apprehension has been considered instrumental in elevating his case. Similarly, a police officer from North Carolina was charged with murder only weeks earlier after an eyewitness caught on cameras as he fired eight shots at a man, killing him. The DoJ says agencies interested in applying for a body camera grant have until June 16 to do so.